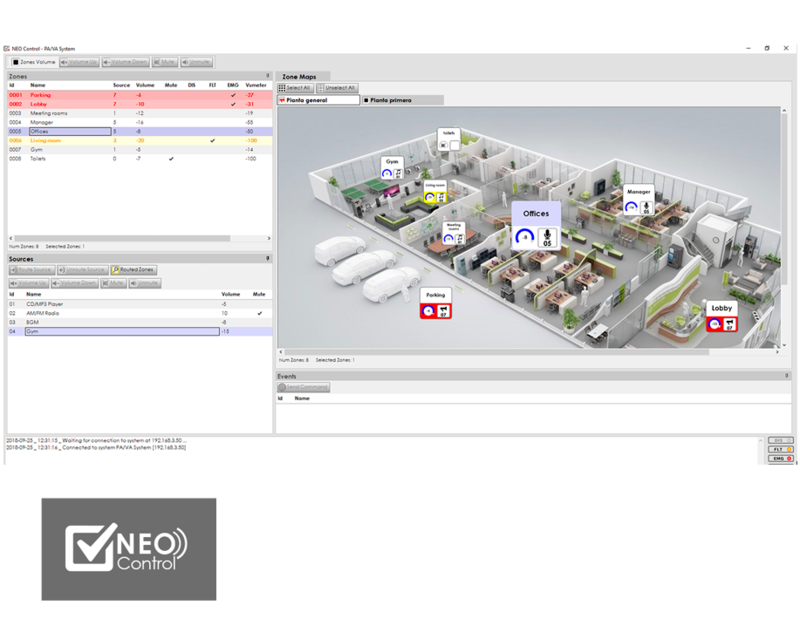 NEO Control is an auto-install application without a database that allows to easily control and supervise any NEO system by remote and safe access. Central and secure control of the NEO system. Total system supervision (failure, evac mode, etc.) by zones. Allows to add installation drawing plans. Synchronised with the NEO system. Without the need to configure databases. Exclusive for NEO sytems (NEO 8060 and NEO Extension units). One NEO system can accept up to 5 connections from NEO Control. NEO Control allows to control only one NEO 8060 + NEO Extensions system. Multiple NEO system cannot be controlled by NEO Control. Download NEO Control in this link. Install the software on the PC that will control the NEO system. Execute NEO Control and copy the license key displayed on the start window. Enter the license key from step 3, the serial number of the product (included in your license card) and the distributor number (*). Execute NEO Control and enter the key generated on step 4. Check the handbook about the licensing procedure here. (*) LDA’s client ID or license provider number.